If the most important thing a Sales Professional can do is sell, why do Sales Leaders put so much emphasis on forecasting? And how do you forecast accurately and how does pipeline coverage tie in? I will answer these questions with help from Derek Loh of Unit4. Unit4 is a leading global provider of enterprise applications for Professional Service Organisations and Derek is in charge of sales operations in the Asia- Pacific region. Sales forecasting is all about budgeting. The only way an organisation can function effectively is by knowing how much money is coming in each month or each quarter. Reliable sales forecasts allow the organisation to decide how to invest its money to grow the business. For manufacturing companies, good sales forecasting is essential for managing the supply chain and to ensure reliable delivery times. In the case of Unit4 the executive management keeps a very careful eye on the health and profitability of the company. They are owned by a global private equity investor. In Derek’s opinion, a Sales Team member who understands the importance of forecasting is a team player. The company’s success (not just their own income) is at the top of their priorities. How do you forecast accurately? 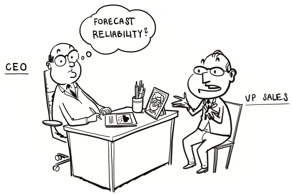 According to Derek, forecasting is a combination of art and science, with many factors to be taken into consideration. For an established business operating in a stable market, forecasting accurately is far easier than for a start-up business or one operating in a volatile market. Take Unit4 as an example. This is an organisation working across many market sectors in many parts of the world. Their primary business focus is on providing people-centric software solutions to service organisations. A significant part of the business is made up of license renewals and Derek says that this is a highly predictable area of the business. More difficult to forecast is new sales, particularly to new customers. This is where we get into the difference between hunters and farmers, and the importance of pipeline coverage, more of that later. Derek has his own approach to forecasting for this area of the business. He looks at the deals in the pipeline and starts by taking out the large ones. Assuming he is left with around 50 deals of a similar size and type, he can use historical performance and what he knows about the market to forecast in this area to within 5%. Derek takes the bigger deals and looks at them in detail, often running an opportunity pit-stop to get a really clear view of the opportunity. The pit-stop may lead to a simple conclusion that the opportunity should be included in the forecast but often raises questions about whether and when the deal will actually be signed off. This usually depends on how well the Sales Person understands the customer’s buying process and has their sales process under control. Another issue is the actual value of the sale. For an organisation like Unit4 – selling enterprise software – the sale could involve licence fees, implementation fees, professional services, training and sometimes more. Again, it is very important that the Sales Person understand exactly what value the customer has in mind when it comes to the final deal. We have worked with Unit4 to draw up a list of closing qualification criteria. These include defining exactly what is understood as the signing date, the people involved in the final sign off, any risks associated with the sign off, details around integration (especially if 3rd parties are involved), legal issues and any issues around price or anything else that may need to be negotiated. Your pipeline is the number of deals you have that you are currently working on and coverage is the number you need in the pipeline to meet your target. You may hear people say you need three deals in the pipeline for every one you close, but this is far too simplistic. The pipeline coverage you need to deliver a reliable forecast depends on how competitive the product or service you are selling is, how good the leads are, the average deal size, how good the Sales Person is and the percentage of time actually spent on selling. The results of a recent time and activity allocation survey suggest that sales people spend more than 50% of their time on non-revenue generating activities. Not good news for pipeline coverage and forecast accuracy. To maximise pipeline coverage from new and existing customers many organisations differentiate between Hunters and Farmers. Hunters are Sales People who are tasked with going out and sourcing their own leads, usually from new clients. Problems can arise in the long term when Sales People manage their time poorly and spend too much time on opportunities already in the pipeline and not enough time on generating new ones. Which brings us to Farmers. These are Sales People – sometimes called Account Managers - whose role is to work with existing customers. This involves keeping them happy and making sure they renew their contracts while looking for opportunities to cross sell or up sell. Farmers require a lower pipeline coverage than Hunters. And Waiters? Those are the Sales People who sit there and expect leads to be brought to them by marketing - like customers in a restaurant being waited on. Unit4 is not the right place for Waiters. In fact, Unit4 Asia-Pacific encourages its employees to be brand ambassadors of their solutions and has programs in place to support this initiative.. There are arguments for and against separating Hunters and Farmers but whatever position you are in, you have to use your time well to make sure you have sufficient opportunities in your pipeline to meet your targets and to deliver a reliable forecast - even if your largest deal is lost or slips. Achieving your targets is important, but good forecasting is about making an accurate call about the value of deals you are going to close at the end of the period. That is the information the organisation needs to plan and operate effectively and you will gain the respect of the management team if you consistently call a number that you go on to deliver. In the long run, if you forecast well, your professional reputation within your organisation will grow and you can argue for achievable targets that will earn you your commission. Derek has delivered increasingly accurate forecasts for Unit4 and this has certainly earned him the respect of the leadership team in Unit4 Asia Pacific. I hope his insights will help you to improve your forecasting and pipeline coverage. Do you know your customer’s buying process well enough to forecast when a deal will be signed off? Do deals frequently slip without knowing the real reasons? Do you manage your time well between filling your pipeline, working on opportunities and retaining existing customers?